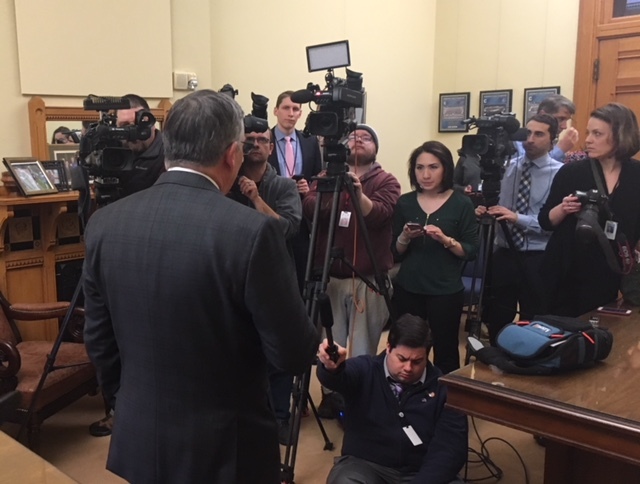 Senate GOP leader Len Fasano explaining the unanimous opposition by his caucus to the confirmation of Andrew J. McDonald. Senate Republican leader Len Fasano informed Gov. 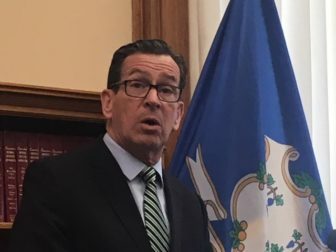 Dannel P. Malloy on Monday that all 18 GOP senators intend to vote Tuesday against the confirmation of his friend and former legal adviser, Andrew J. McDonald, as chief justice of the Connecticut Supreme Court. With the recusal of one Democratic senator in the evenly divided Senate, the GOP has an effective majority of 18-17 on the question of whether McDonald would be confirmed as the first openly gay chief justice of the highest court in any state. In a hastily called press conference, Malloy said he will not ask McDonald to withdraw his nomination, and the Senate still intended to vote Tuesday. Senate President Pro Tem Martin M. Looney, D-New Haven, and Senate Majority Leader Bob Duff, D-Norwalk, whose party’s nominal control over the Senate agenda relies on the tie-breaking ability of Lt. Gov. Nancy Wyman, quickly compared the state Senate GOP to Washington Republicans. Fasano said Democrats were overreacting, and McDonald’s sexual orientation played no role in GOP opposition. He noted that Republicans overwhelmingly voted for his confirmation five years ago as an associate justice. Fasano expressed hope that the rejection Tuesday would not jeopardize Connecticut’s relatively depoliticized traditions of judicial appointments and confirmations. A foundational element of that tradition is a rebuttable presumption that governors will re-nominate judicial appointees of previous governors when their eight-year terms are expiring. With the exception of probate courts, judges in Connecticut are nominated by governors, subject to confirmation by both chambers of the General Assembly. Governors can choose nominees for appointment and re-appointment from a pool of candidates cleared by the non-partisan Judicial Selection Commission. Judges are traditionally reappointed until reaching the mandatory retirement age of 70. Malloy hedged Monday when asked if this would change his view. It most likely is a moot question: Every judge whose term is expiring this year already has been nominated for a new term, and Democrats in the legislature say they have no intention of denying confirmation to any GOP appointees in retribution. Last week, Malloy offered to nominate a former Republican senator, Superior Court Judge Andrew W. Roraback, to succeed McDonald as an associate justice on the state’s highest court in return for support of McDonald’s confirmation. 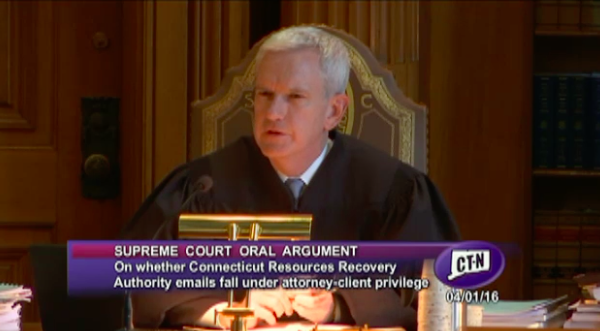 On Monday, Malloy called that offer an effort to combat any concerns that the court was tilting left. McDonald, 52, a former Democratic state senator, was confirmed by lopsided votes five years ago when nominated by Malloy as an associate justice of the court. But his confirmation as chief justice cleared the House of Representatives recently by just a single vote. The House approved his nomination on a vote of 75-74, with one Republican in favor. Five Democrats joined 69 Republicans in opposition. Several Republicans said McDonald, who was the governor’s legal counsel when the legislature passed a law repealing capital punishment for future crimes, should have recused himself. Legal experts have countered that he was within his rights to participate. Republicans also questioned the legal basis for the court to preserve the sections of the law repealing capital punishment, while striking down only the section that differentiated past crimes from future ones. Opposition to McDonald over the death-penalty case was foreshadowed a year ago, when the Senate nearly blocked the reappointment of the decision’s author, Justice Richard N. Palmer. Palmer was confirmed on a 19-16 vote in the Senate, but only after Fasano urged some of his caucus members to consider their opposition, Fasano said. McDonald’s confirmation is supported by the Connecticut Bar Association and dozens of faculty members at the Yale, University of Connecticut and Quinnipiac law schools. Republicans have the ability to block a full debate Tuesday on McDonald’s confirmation, but Fasano said the GOP will not do so. By a tie vote, the legislature’s Judiciary Committee failed to send a favorable report on McDonald to the floor. Before the Senate can debate his nomination, it first must reject the unfavorable report, a motion subjected to limited debate.